All framework & module packages are deployed to MyGet every night in weekdays. So, you can use or test the latest code without waiting the next release. Go to Tools > Options > NuGet Package Manager > Package Source. Click the OK button to save changes. 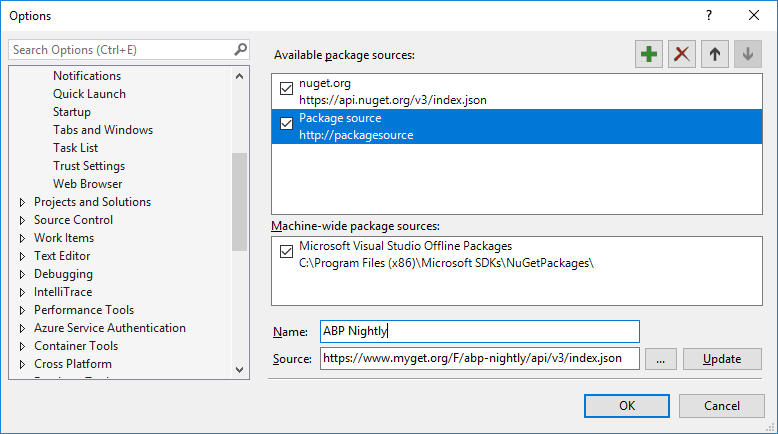 Now, you can install preview / nightly packages to your project from Nuget Browser or Package Manager Console. In the nuget browser, select "Include prereleases". Change package source to "All". Search a package. You will see prereleases of the package formatted as (VERSION)-preview(DATE) (like v0.16.0-preview20190401 in this sample). You can click to the Install button to add package to your project.